Saint Joseph the Worker - My Catholic Life! Besides the Virgin Mary, there are just two saints who have more than one feast day dedicated to their honor on the Church’s universal calendar: Saint John the Baptist and Saint Joseph. Pope Pius XII instituted today’s feast in 1955 in direct response to the surge of atheistic communism in the decades after World War II. Communism at that time was not so clearly understood as the dehumanizing, anti-man, politically corrupt, and economically anemic system that it later revealed itself to be. Communism, after all, had helped defeat fascism in Germany and Italy, so it was understood as a liberating force, not an oppressive one, in some countries. May 1, or May Day, was the day of the worker in communist lands: a day of rest, of triumphant militaristic parades, and of pride in all that communism had accomplished, supposedly, for the proletariat. Keen observers, including many Catholic intellectuals, Pope Pius XII, and one future Pope then serving as a priest in Poland, knew better. They had already, intellectually, torn the mask from the true face of communism. Part of the Church’s response to the communist appeal to workers was to exalt Saint Joseph the Worker on May 1 as a Catholic alternative to May Day. Not only was Saint Joseph to be understood, then, as the husband of Mary and the foster father of Jesus, but also as the patron of labor. He was the carpenter, the working man, who taught his God-Son how to swing a hammer and run a planer over a rugged plank. Pius XII’s exaltation of Saint Joseph the Worker was an attractive idea. Saint Joseph was a true icon of human labor in contrast to the rough factory worker in an industrial plant in Leningrad or the tanned farm hand threshing hay under the Ukrainian sun. Saint Joseph did not have his fist raised in anger at the capitalist oppressors of Nazareth. He was not leading a mob to burn down his boss’s house. Saint Joseph worked like a normal person worked. He was quiet about it. He did his duty. He provided his family with food and shelter. He didn’t see injustice lurking behind every corner. He most likely made excellent furniture and received a fair wage for his handiwork. Work, from a Catholic perspective, is a source of dignity. It has to be done. A life of pure leisure is no life at all. Work and want and trying times are required ingredients in the recipe for a mature, responsible adult. No work, no adult. Work itself is not pure punishment. The onerous nature of work is one of the effects of original sin, though it was not so in the beginning. Work became a burden due to the sin of our first parents. What is the theology behind this? God the Father worked and God the Son worked. When man works, then, he is participating in God’s own work. Subduing the earth is one of God’s original commandments to man. And subduing the earth cannot come about except through work of one kind or another. It has been observed that the dash (–) on a tombstone is far more important than the years that are on each side of it. What happened in the time of that dash is more important than one’s date of birth or death. For most people that dash denotes work. Mankind works. All the time. And the will of God for us cannot be found outside of what we spend most of our life doing. If that were the case, then we wouldn’t have much of a religion. God is found in our work. So if we do it well, we give him glory, and if we do it poorly, we offer him a shoddy sacrifice. The earth becomes our altar when our daily work is our daily offering. 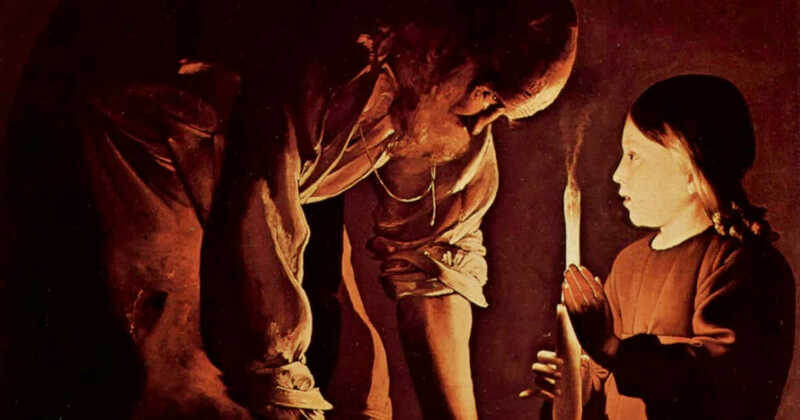 Constant, daily work was good enough for Saint Joseph and for the Son of God. So it is good enough for all of God’s children as well. 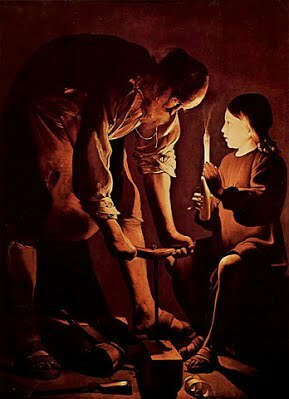 Work is a pathway to holiness, and Saint Joseph the Worker stands by our side to encourage us toward the reward that our daily sweat and labor will earn. Saint Joseph the Worker, inspire all laborers of mind or body to work for their daily bread as much as your glorification. May our work be done well to perfect us and to make us participants in completing the creation you began in Genesis.